I was driving the freeways of Southern California the other day when I saw this huge billboard in Irwindale touting Citizens Business Bank’s SBA loan program. Pretty innovative advertising. So, in the start of a periodic new feature I checked out the bank’s website to see how they market their SBA lending program. 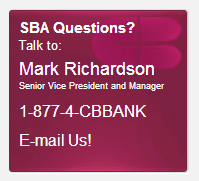 They ask the question, “SBA questions?,” then give the answer with the contact name and telephone number of SVP Mark Richardson. And if you click on 7(a) or 504, they have included the pictures and telephone numbers of two additional bankers. That’s good stuff. I like that prospects immediately have a name and phone number of someone to talk too. The website is very clean, and I like the inclusion of the SBA logo. I would have included Mark Richardson’s picture also. I disagree about not putting email links to the pictures, but I understand why email links weren’t provided being worried about email farmers. However, the bank may wish to consider linking the pics to their LinkedIn profile as another way of prospect contact. I don’t like the fact I have to click on 7A or 504 for more information. The bank is assuming the borrower knows the differences between the two programs. I also would tailor the bullet points to fit the bank’s target market and credit box, rather than generic SBA’s parameters. Send me an email if you would like us to profile your site in the future.